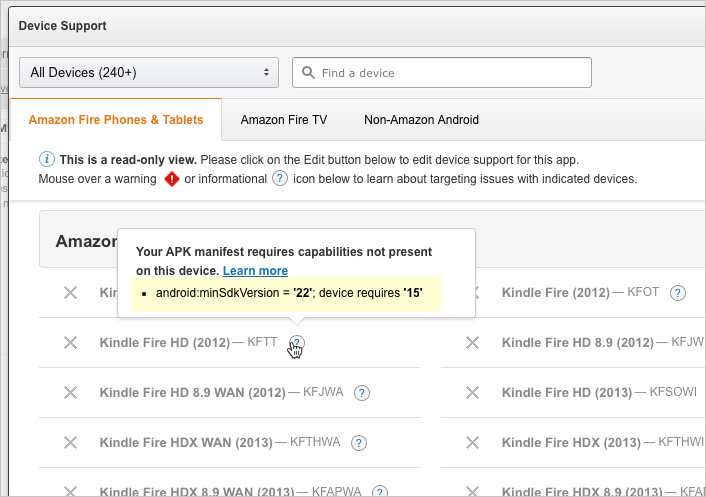 The Amazon Appstore uses your app manifest to determine an app’s compatibility with Fire devices. When you upload your APK in the Amazon Appstore, the APK Files tab highlights incompatibilities between your manifest and the capabilities of devices you are targeting. Use the troubleshooting information here to better understand any error messages related to device support. If you are planning to update your APK, you must fix compatibility issues in your manifest in order to maintain your current device support. If you do not fix compatibility issues, your app will not be available on devices that have been flagged. Also see the Troubleshooting section in the instructions for uploading your APK. In this case, the error message is android:minSdkVersion = '22'; device requires '15'. This means your APK requires at minimum API level 22, but the device only supports up to API level 15. Therefore, your APK can't be installed/supported on the device. The following sections indicate common errors and their resolutions. Refer to Implied Features for additional information. These messages indicate your manifest contains either a <uses-feature> or <uses-permission> element for a capability not supported by the target device. Important: Some capabilities in your manifest imply that one or more hardware features are required by your APK. Refer to Implied Features for more information. If your APK does not actually use the feature in question, remove the offending <uses-feature> or <uses-permission> element from the manifest. If your APK uses the feature in question, but does not strictly require it (i.e. your app tests for the capability and disables related functions if not present), add or adjust the <uses-feature> element to include the attribute android:required="false". If your app strictly requires the feature in question, to safely target the device, you should make code changes so the app gracefully disables functionality on devices without the feature. After testing your changes, modify the manifest to include android:required="false" in the appropriate <uses-feature> element. For more on detecting capabilities, refer to getSystemAvailableFeatures in the Android documentation. Error: android.minSdkVersion = "X"; device requires "Y" Error: android.maxSdkVersion = "X"; device requires "Y"
These messages indicate that the range of Android API levels specified in the <uses-sdk> element exclude the Android API level currently supported by the target device ("Y"). If you intended to target the device, adjust the Android API range to include level ("Y"). See the Tablet Specifications and Fire TV Specifications for the Android and Amazon API levels for various Amazon Fire devices. This message indicates there is no overlap between the screen sizes and/or smallest width defined in the <supported-screens> element and those supported by the device. Appstore applies device filters as described in <compatible-screens>. To target the device, add support for the screen as described by "size" and "width", and update the manifest accordingly. Error: No supported screenSize and screenDensity pair in manifest; device requires "size" and "density"
This message indicates there is no overlap between the <screen> elements specified in the <compatible-screens> element and those supported by the device. Appstore applies device filters as described in the Android spec which can be found in [<compatible-screens>](http://developer.android.com/guide/topics/manifest/supports-screens-element.html. To target the device, add support for the screen as described by "size" and "density", and update the manifest appropriately. Note: Using <compatible-screens> is not recommended. This element can dramatically reduce the number of devices available to your application i.e. Appstore will filter-out all devices with a screen configuration that you have not listed. You should use it only as a last resort, when the application absolutely does not work with specific screen size-density configurations. Error: android.glEsVersion = "X"; device requires "Y"
This messages indicates your APK specifies an OpenGL ES version that is not supported by the target device. To target this device, consult its reference documentation for the proper OpenGL ES version, and update the manifest appropriately. This message indicates there is no overlap between the OpenGL texture compression formats specified in the manifest and those supported by the target device. Details for supported texture compression formats can be found in <supports-gl-texture>. To target the device, add support for a compatible texture format, and update the manifest appropriately. Also, check the capitalization and spelling of the OpenGL texture format in the manifest vs. the device specification.